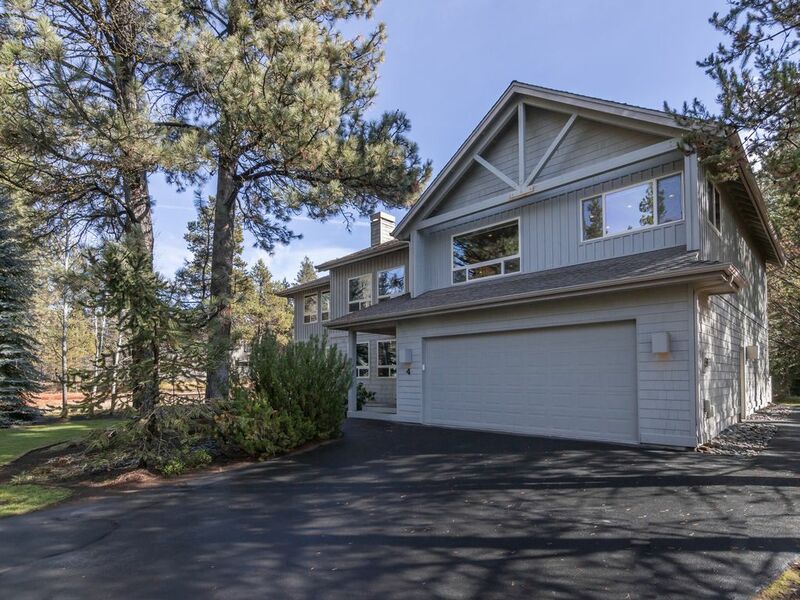 Faites-en des vacances de rêve dans cette luxueuse maison de vacances Sunriver de 5 chambres. Cette impressionnante maison dispose de 3 suites de maître, parfaites pour une escapade en famille et les animaux de compagnie sont les bienvenus! Blue Grouse # 4 est une maison de vacances 5 étoiles avec une tanière et 4 salles de bains. Deux des chambres comprennent un lit king-size, une chambre avec un lit queen-size et les deux autres chambres sont équipées d'un ensemble de lits superposés jumeaux / doubles. Il y a aussi 4 lits Roll-A-Way qui peuvent être utilisés. Cette maison de vacances haut de gamme de 2 étages dispose d'un bain à remous privé, d'une table de billard, de 9 vélos, d'un barbecue à gaz, d'un garage double et d'un bain à remous privé. Le Blue Grouse # 4 est situé à moins de 100 mètres de la rivière Deschutes et à quelques minutes du centre commercial Sunriver Village, du Sunriver Lodge et du centre aquatique SHARC. Cette maison offre 12 abonnements SHARC illimités, tennis gratuit et accès gratuit à la marina Sunriver. 2 Kings, 1 Queen, 2 Twin / Double Bunks, 4 Roll-A-Ways, 3 Master Suites, 4TV / 4VCR, micro-ondes, D / W, W / D, HOT TUB, table de billard, canoë, cheminée, 2 niveaux, 9 vélos, barbecue à gaz, garage double, situé à moins de 100 mètres. de la rivière, 3184 pieds carrés, 5 étoiles, 12 passes SHARC illimitées. Si vous souhaitez plus d'informations sur cette location Sunriver ou nos services de gestion immobilière Sunriver, veuillez nous contacter. Closest location to the river made our stay wonderful. We brought our own canoe, and there is one in the house. We love biking, jogging, walking, swimming, playing tennis and enjoyed all of this in close proximity. The microwave and management promptly brought us a back up. Very clean space, with all you need in the kitchento barbecue and prepare food for the 12 of us. One complaint: the upstairs screen door does not function properly. This invited flies & a few mosquitoes. Thank goodness there was a flyswatter. Everyone really enjoyed the pool table also. The two downstairs bedrooms are pretty quiet for those who retire earlier. We appreciate the extra roll out beds. Thank you for your Review, David! It sounds like you had a great time at the home and enjoyed the property and it's proximity to the river! We hope to see you again soon! Our family group (3 families) stayed at Blue Grouse #4 for a warm week in late July / early August 2018. It was intended to serve as the main house for shared meals for 5 small families. Unfortunately the AC was not adequate for a house this size when the temperatures hit the mid-90s. The MW oven was not working at all, the broiler did not work, the dishwasher barely did its job. The pool table and owner's bikes were very welcome touches. Nice house close to the river. I liked this house the best of all the ones I have rented Sun River. It was nice because two of my children come as couples and there were two king beds and 3 suites (a queen for me). The kitchen is great, but they could use more small tools like measuring cups and spoons, spatulas, etc. We love being close to the river and the air conditioning worked well. My biggest complain was the cheap toilet paper, Kleenex, soap and paper towels. I haven't staying in any hotel with as cheap stuff as this. I would probably have to change property management or bring my own for next time. Wonderful place with great space for large family. It was great! The only thing I would suggest is replacing the bottom mattress in one of the bunk rooms. (the one on the left as you face the doors) It really sags to the middle. We stayed in this house 8 years ago and loved it and will recommend it to others and hope to stay there in the future! Thank You for the 5 star Review, Sheryl! We are glad to hear that you enjoyed your stay - Let's hope we see you again in less than 8 years! Come back soon! Thank You for the 5 star Review, Gabriela! So glad that you enjoyed your stay, come back soon! We were overall pleased with the convenience of the vacation rental. It suited our family well for space and activities. The overall stay was enjoyable. The house was very clean upon arriving. The smell of carpet fresh or some other type deodorizer was a bit strong in the downstairs master suit. I am sure this is do to the house being pet friendly. Some of the furnishing looked a bit well used. The barbecue was a bit to rusty and we choose not to use it. The only other inconvenience was the upstairs master suite bathroom. The shower handle was installed upside down and the turning ratio would not allow the water to get hot. We frankly were busy enough that we just lived with it. When maintenance was called for no lights on the deck and a clogged disposal they responded swiftly and corrected the problems. Thank You for the 5 star review, Kendra! We hope to see you again in Sunriver! Facilité SHARC aquatique avec piscines intérieure et extérieure, Lazy River, 2 Glissades d'eau! Gratuit & réduits accès! Minimum night stay may apply. Please Call/Email for Details.